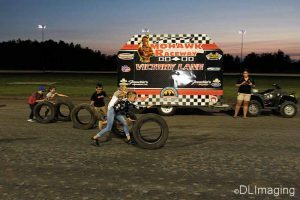 Story By: TIM BALTZ – HOGANSBURG, NY – Lazore’s Construction was on hand as the night’s sponsor and the longest running sponsor in track history along with the great race fans were ready for an action packed night in all 5 classes. The Twin Leaf Convienience 358 Modifieds had a non point event which led to heads up start putting the only 2 winners on the year on the season as Chris Raabe and Tim Fuller led the field to green. Chris Raabe would get the advantage heading into turn 1 over Fuller, Louie Jackson Jr., Matt Woodruff and Brian McDonald. The top 2 drivers began to put on a display of driving talent as they raced hard for the top spot in the opening laps. Fuller tried several times to get by on the bottom but was not able to get the run he was looking for as Raabe kept his car on the top side of the race track and in control. After several laps of swapping grooves and the occasional coat of paint, Tim Fuller would take over the lead on lap 9 and begin to open up a big lead on the field. Behind Fuller Raabe was all by himself in 2nd while Louie Jackson Jr. continued his great season as he took over the 3rd spot from Matt Woodruff but still had a long way to catch the top 2. Fuller was lapping cars at will as he started to lap up into the top 10 just past halfway and appeared to show no signs of slowing down with Chris Raabe, Louie Jackson Jr., Matt Woodruff and Carey Terrance completing the top 5. With 5 to go Tim Fuller had put a lap on everyone but the top 5 and was in the process of doing that when the caution flew for Brian McDonald who slowed while running 6th on the front stretch. The final restart was the only shot anyone had but the veteran pulled away by 3 car lengths as Raabe and Jackson tried to keep pace. In the end Tim Fuller would go unchallenged to score his 6th win of the season, 3rd in a row and kept the streak alive at 10 straight weeks as being 1 of 2 winners in the division. Chris Raabe came home 2nd marking the 3rd 1-2 finish for those 2 drivers. Carey Terrance ran a solid race and came home 3rd over Matt Woodruff and Louie Jackson Jr. The Crossroads Tobacco Sportsman 25 lap feature saw Delbert Legrow Jr take the lead early on over Mike Stacey and Brianna Ladouceur. On lap 4 Mike Stacey turned it up a notch as he took over the top spot brining Ladouceur to the number 2 position and the battle was on. 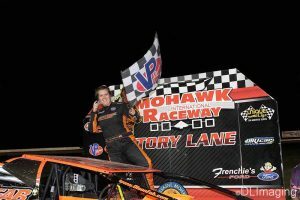 Both Stacey and Ladouceur needed good runs to happen and on this night they were clearly the class of the field as they pulled away from Legrow, Anthony Rasmussen and Thomas Cook. At the halfway point the track began to change slightly as everyone was fighting for the bottom lane making it difficult to pass. Ladouceur hounded the leader as they both entered into traffic on lap 14 with Rasmussen, Cook and Gauvreau completing the top 5. 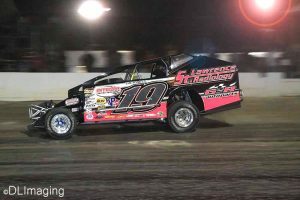 The handling on Mike Stacey’s car began to slowly go away after lapped cars made it tough to get by leaving the door open for Ladouceur to take advantage. On lap 17 Stacey slid up the track and off turn 4 Brianna Ladouceur would take control of the race and start to open up a strong lead. 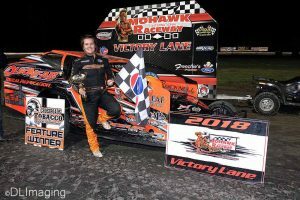 As the laps wound down Mike Stacey tried at will to keep pace but it was not meant to be as Brianna Ladouceur got back to victory lane for the 3rd time and first since June 8th of 2018. Mike Stacey took his car to 2nd with Anthony Rasmussen, Thomas Cook and Zack Arquiett who charged from 10th to complete the top 5. In Green’s Performance Mod Lite action it was a rough start for Deric Ellsworth as heading into turn 1 he would tangle with another car forcing him upside down and the red flag was displayed. Ellsworth was shaken up but would climb out unhurt. When the green flew for a complete restart on lap 1 Styles Arquiett would have issues as he spun off turn 1 and the yellow would fly. 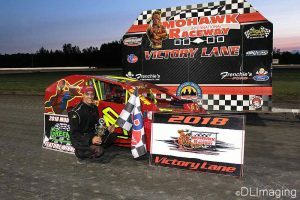 Once the race got back under way and the laps began to click off it was Harley Brown assuming the top spot over Dan Reif and defending track champion Nick Mallette. 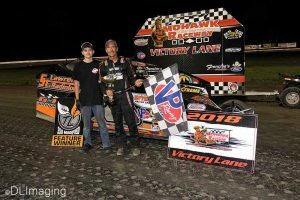 It took nearly 2 years for Brown to get back to the winner’s circle in 2018 but he had a great race car as Dan Reif and Nick Mallette did all they could to keep pace. 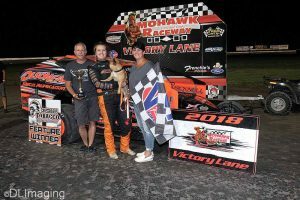 In the closing laps Dan Reif who was in search of win number 4 on the year began to reel in Harley Brown for the top spot and the chase was on. 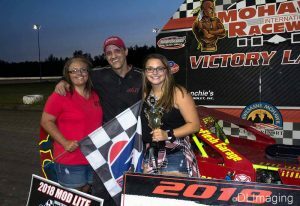 But this night belonged to Harley Brown as he took home his 2nd win in the last 3 weeks and celebrated his wife’s birthday in victory lane. Reif held on for 2nd with Styles Arquiett overcoming early race problems for 3rd with Nick Mallete and Kevin Foster completing the top 5. 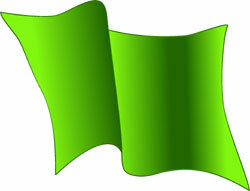 Novice Sportsman saw Xavier Perrin take the lead at the drop of the green flag over Eugene Tarbell and Jonathan Rush. 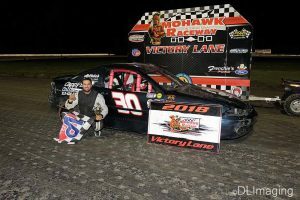 Perrin was running strong using the inside lane all the way around the speedway and was looking to score his first ever Mohawk win. On lap 5 the caution flew for Jonathan Rush as he hit the wall hard in turn 4. He would be ok. On the restart Perrin continued his great run over Tarbell, Brian McGinnley, Kurt Russell and Joshua Pete. 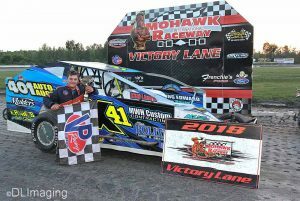 As the laps began to click off and the checkered flag was in his sight Xavier Perrin had a game plan and stuck with it on this night, after a few weeks of frustration the Brockville native would put it in victory lane for the first time in 2018 and 2nd overall having collected a win in Rookie Sportsman at the Brockville Speedway earlier in the year. Brian McGinnley’s bid at win number 2 ended up in 2nd over Eugene Tarbell Joshua Pete and Lee Barcomb. 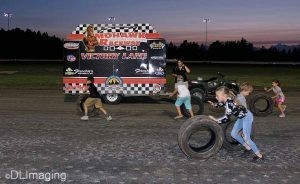 The Bandit 10 lap event would be the night cap and Ian Bressett took the lead over Nick Perham and Mike Pecore. It was not a good night for 3 time winner Gary Sharlow as he spun his car in turn 1 on lap number 2. When the green flew Bressett held the lead but Francis White was on the move as he took over the lead on lap 3 bringing RJ Tressider to 2nd over Nick Perham Michael Daniels ad Jeff Trapp. White was on cruise control and looking to run away and hide from a quality field. Without a caution flag in the final laps Francis White would go unmatched to score his first win of the year in just his 2nd start of 2018. RJ Tressider would claim his 5th runner up finish on the season over Nick Perham, Ian Bressett and Jeff Trapp. 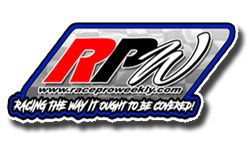 Next week a full show in all 5 classes will take place with the good folks at White’s Plumbing on hand as the title sponsor. Racing action begins at 7:30pm.